With its famous Roman aqueduct and a stunning castle, rumored to have inspired the castle in Disney's Sleeping Beauty, Segovia is perhaps the most interesting of the day trips from Madrid. Segovia has its festival in late October. There is also the Hay Festival in late September. There are some excellent guided tours that add more into your day than you could possibly do by yourself. Segovia Tour & Winery: Combine a cultural guided tour of Segovia with a visit to a local winery. Segovia and Avila Combined Tour: Visit these two cities on a single trip. Avila has some of the best-preserved city walls anywhere in the world and is a short ride away from Segovia, which means you can get the most out of your day without spending half your time stuck on a bus. Hot-Air Balloon Ride Over Segovia: For a real sense of adventure, see Segovia from the sky! Fly over Segovia's most famous sights in a hot-air balloon as your guide tells you the history of the city. A pick-up from central Madrid is also possible. Segovia is an easy day trip from Madrid and can be reached by both train and bus. Segovia is also possible as a day trip from Salamanca, though there are few buses. Best to go via Avila. Back to Madrid or on to Salamanca. Avila is only an hour from Segovia by bus (both can be done in a day if you don't mind leaving early and getting back late. El Escorial is also an option - retrace your steps on the C8 line of the Cercanía local train network and change at Villalba. If coming into Segovia by bus, don't make the mistake of heading straight towards the cathedral (which is up on a hill and visible from the station). The nearest site of interest is the aqueduct, which is actually signposted from the junction at the bus station and is actually just around the corner, along Avenida de Fernández Ladreda (if you're coming by train, you'll have to walk along Paseo Conde Sepúlveda until you reach the bus station and then turn right). Next to the aqueduct is an excellent Tourist Office. 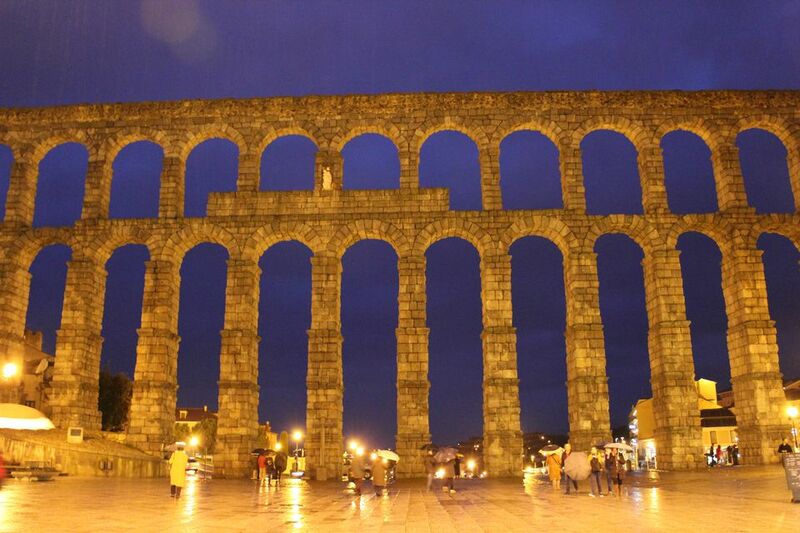 Incredibly helpful and with great tourist information on the whole Castilla y Leon region and other areas too, this is an essential stop and another reason for the aqueduct to be your first stop as these guys can plan your entire trip for you! From the aqueduct, head up c/Cervantes, past Casa de los Picos, up to Plaza del Corpus Cristi, which is where the Synagoga Mayor (Main Synagogue) is situated. From there it's up to Plaza Mayor and the Cathedral. Walk along the Cathedral and keep going, past the Witchcraft Museum on c/Daoiz until you reach the Alzcázar. This route is the most efficient way to get to see Segovia's main sites if you are in a hurry. If you decide to take a different tour of the city, take a map and pay no attention to the road signs that direct you from Plaza Mayor to the Aqueduct - these are driving directions to guide cars around the one-way system and only complicate matters if you are on foot.